Summary : Like Spearmint? Like Tea? If you answer yes to both these questions, head on over to the Dragonwater Tea Company (now out of business) and get this tea. Enough said. Review : If there is such a thing as a "mint-a-holic," I would most certainly fit the description. I love all things "mint" and will thus try any tea that I happen to stumble across that has "mint" somewhere in the lable. And so this evening while digging through my tea selection, I came across a forgotten about spearmint herbal tea from the Dragonwater Tea Company (now out of business). And so like a deranged pavlov dog, I couldn't resist giving this tea a try. 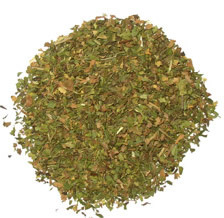 Here is how the Dragonwater Tea Company (now out of business) descibes this tea : "Spearmint (Organic) Tea. Cut and sifted organic Spearmint from the Pacific Northwest direct from the farm. Spearmint has been used to help with upset stomach and nausea." As you can tell from the ingredients, this tea contains organic spearmint leaves...and nothing else. Should you order this tea and it somehow arrive without a label, as soon as you open up the tea bag there will be NO mistake about what kind of tea this is. As soon as you rip open the bag, a very, very strong aroma of spearmint tumbles out. And what a wonderful fragrance it is. Indeed, I still think spearmint teas have one of my most pleasing fragrances around, perhaps only second to jasmine teas. Needless to say, with such a powerful aroma of spearmint emanating from the bag, I really believed that I was going to enjoy this tea immensely once it was all brewed up. So, I scopped out the leaves, poured the boiling water, and inpatiently began the 8 minute countdown. My patience was rewarded I'm pleased to say. This tea is pure spearmint, and my, does it pack a punch in terms of flavor. This tea probably comes as close to savoring a spearmint life saver as you are going to find. I really don't have much more to say about the flavor of this tea except this...if you love spearmint, you'll love this tea. Like all mint teas, this spearmint tea is a superb "after-dinner" tea. And just like it is advertised as, and similar to peppermint teas, this spearmint tea will undoubtedly help soothe an upset stomach or help aide in getting rid of that "bloated feeling" after you eat too much. But oh my, don't bury this tea on your kitchen cupboard and only use this tea for that purpose. True, this tea has a long-lasting and delicious spearmint after-taste. Thus, unless you want to go to bed with spearmint lingering on your tongue, perhaps this does not make for the ideal "before bedtime tea." Then again, what's wrong with going to bed with a spearmint taste in your mouth??? Recommendation : Absolutely. This is a superb spearmint tea. If you enjoy "spearmint things," and in particular other spearmint teas, you're missing out if you don't give this tea from the Dragonwater Tea Company (now out of business)a try. Brewing Instructions : Use 1.5 teaspoons of tea leaves. Pour 1 cup (5.5 ounces, but 6 works quite nicely) boiling water over the leaves. Let the tea brew for 5-10 minutes. 7.5 minutes brewing time was used for this tea review.